Description: CBRW shuffles the yard while a EB coal dbu passes by and a WB oil train slides down the siding. Description: BNSF 2645 on the far set of tracks, and BNSF 5945 (whos probably getting a complex since its been a good 30-40 minutes since we last took a picture of her) - BNSF 5726 with that coal drag, curving through the Pasco yard area. Description: BNSF 2645 at the north end of the power group awaiting sort duty in the middle of the Pasco yard. 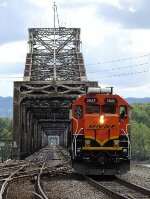 Description: Long-nose first running hard and relatively fast north across the Columbia River Train Bridge. Description: Road switchers shut down for the afternoon.